Reeeeally? That's interesting. I was basing my assumption off the Invasion of Char cinematic, where General Warfield et al look out the front and downward. You don't see any of the vessel from their view, suggesting they're at the front. Moreover, the Escape from Mar Sara cinematic suggests the bridge has windows going all the way around it, not just in the front. If you're right, that gives further credence to your estimated scales. Reeeeally? That's interesting. I was basing my assumption off the Invasion of Char cinematic, where General Warfield et al look out the front and downward. Hmm, I always figured that the room they were in was some sort of an observation deck, rather than the bridge. For one thing, it's much bigger and emptier, with a long red carpet, framed paintings, and no real seats or consoles or crew members. Sure, it has that tactical holo-table thing, but that's it. Similarly, the Brood War intro takes place on some kind of observation deck that's distinct from the bridge (with music and alcohol for the commanders), both are maybe somewhere on the bottom of the battlecruiser? I went with the SCG 'bat for size variation, and to show the different kinds of armor. 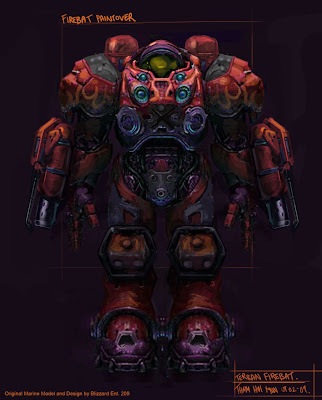 Plus, the firebat suit really doesn't need to be so bulky that it doesn't even get to fit through doors, or have hands. Last edited by Robear; 01-21-2012 at 02:17 AM. Yeah, who knows where the crab legs come from? It looks closer to a Corruptor in SCII. What's your approach here Robear? Looks like these were sketched out then scanned and colored in photoshop, maybe with an Overlay layer. I've always liked that style, reminds me of Keith Thompson's art. I like seeing the evolution of a piece of art in the final product; it has a palimpsest quality. I look forward to your Protoss interpretations. What's your approach here Robear? Looks like these were sketched out then scanned and colored in photoshop, maybe with an Overlay layer. Yup, that's the method (well, not with photoshop, but, yeah). 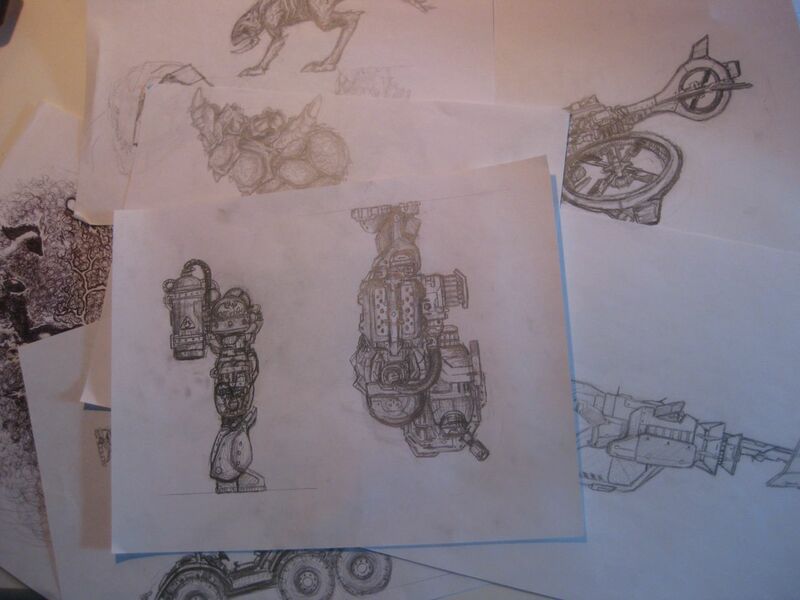 First I sketch everything out... So now I have a lot of these lying around. I got better at doing them faster, so I'll probably go recolor some of the old lackluster looking ones, like the zealot. On the other hand, I used to try to put more work into the original drawings, so while the colors for the Dark Templar are simple, the picture is still one of the coolest imo. 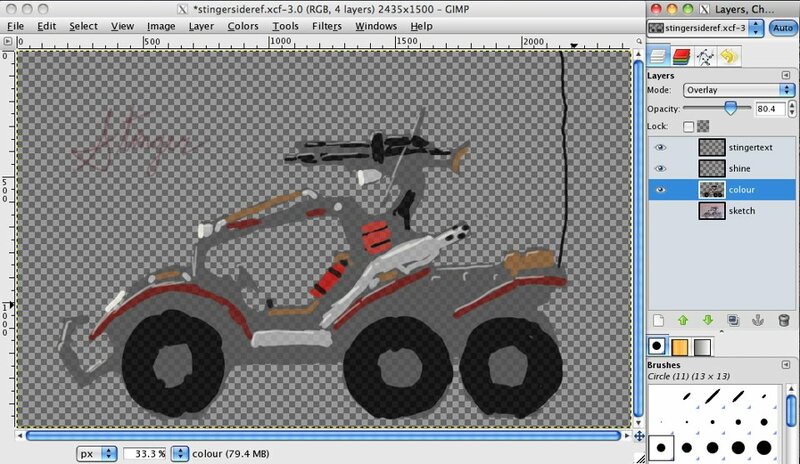 All the individual pictures are drawn regardless of scale, so I import them into a flash document where I can keep fiddling with their size without losing any resolution. I plan to add Protoss units today; I don't want to finish all the zerg and terran and just have to draw protoss after protoss, although that would probably be better for stylistic consistency. 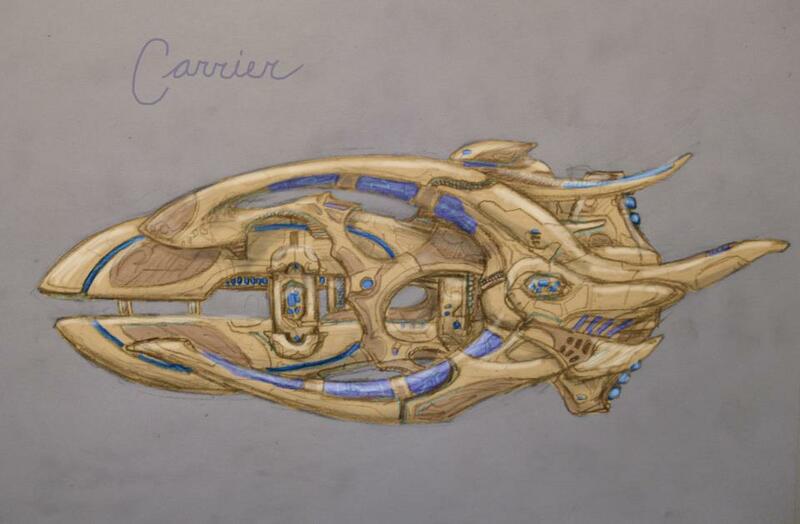 After drawing a few ships, the reaver will probably look pretty shoddy. 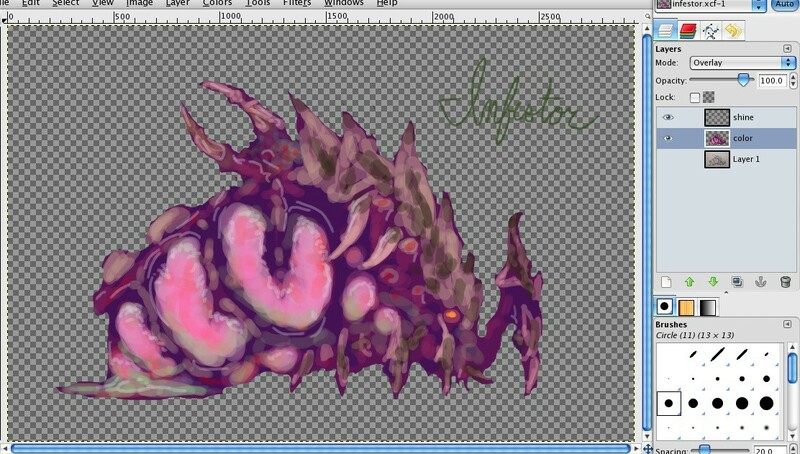 I tried to meld the game model (which is really cool) with the concept art version (which is also really cool). I think it looks good. It'll be fun to do the void ray in this style. Last edited by Robear; 01-22-2012 at 11:43 PM. That's boss. I just wish you'd work a little bit more on it. The detail is getting a little muddled; it can definitely benefit from some suggestion of depth. I really, really like this carrier. Aw, man, that's totally awesome, I wish they'd stuck with that. I just wish you'd work a little bit more on it. 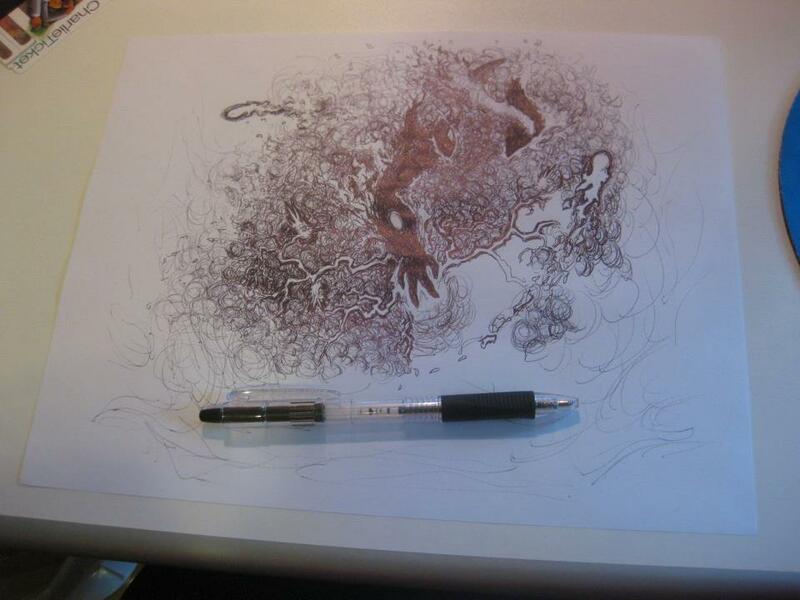 The detail is getting a little muddled; it can definitely benefit from some suggestion of depth. I see you've added small windows onto the sides. 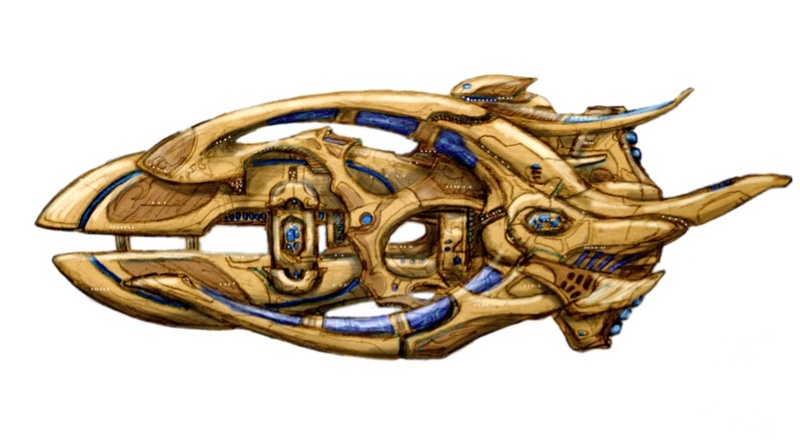 I've always thought of the StarCraft II era Carriers as essentially being flying Star Gates, whereas the ones from the Brood War era were more like roving manufacturing plants / typical carriers. I think the latter concept works better for all the windows and larger crew complement. Awesome work man! I can't wait to see more! Gamescom Attendees? Any pictures / videos?